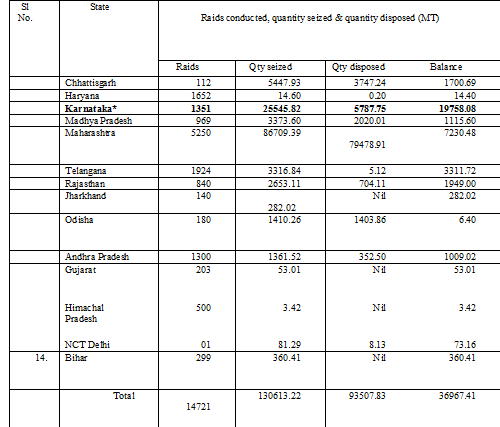 As per the reports received from the State Governments till December 15, about 93,507.83 MT pulses seized under de-holding operations have been auctioned or offloaded through other options in the market to increase availability. This will help to moderate the prices further. Since imposition of the stock-holding limits on pulses by the States, 1,30,613.22 MT pulses have been seized till December 15, 2015. States that conducted raids, seized pulses and disposed them, included Chhattisgarh, Haryana, Karnataka, Madhya Pradesh, Maharashtra, Telangana, Jharkhand, Rajasthan, Odisha, Andhra Pradesh, Gujarat, Himachal Pradesh, Delhi and Bihar. *** The High Court of Karnataka on 23.11.2015 declared the Department of Food & Civil Supplies’ seizure of pulses stored by traders as “illegal” and ordered the release of pulses, edible oils and oil seeds from them.